The temperature is dropping and days are getting shorter, which means only one thing: soup season is here! That’s why today I’m sharing this delicious, healthy recipe for Creamy Kabocha Squash and Cauliflower Soup. Pureed, silky smooth soups made from vegetables are the perfect answer to your cold-weather cravings. No need for heavy cream or loads of cheese, the same rich texture can be achieved by simply pureeing hearty, seasonal produce with fresh and dried herbs, broth of your choice and a touch of almond milk. Kabocha squash and cauliflower are both in peak season right now, and they are the perfect base for a creamy, nutrient-packed Creamy Kabocha Squash and Cauliflower Soup to get us through these next couple of busy holiday months. The two come together perfectly in this soup, especially when reinforced by a healthy dose of fresh ginger, ground cardamom, and cayenne. 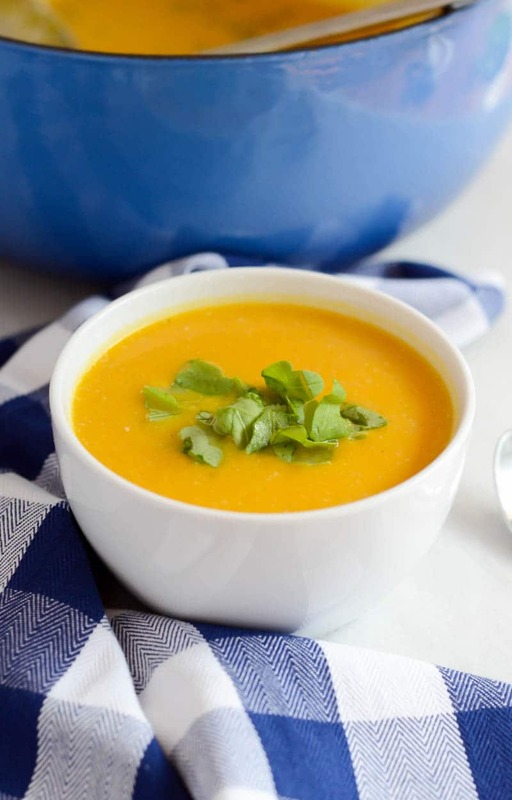 Two other great things about this Creamy Kabocha Squash and Cauliflower Soup? It comes together quickly and freezes incredibly well. It’s the perfect dish to make on a busy weeknight, or on a meal prep Sunday when you have a packed week looming ahead. You’ll first want to get the onion, garlic, ginger, squash, and cauliflower sautéing in the bottom of a large stockpot or Dutch oven. Once they’ve gotten a decent head start, you can add the spices: cardamom, cayenne, and some bay leaves for good measure. Cover the whole mixture with a healthy serving of broth (I used chicken stock, but vegetable stock would work just as well if you want to keep it vegan) and let it simmer until you can pierce the squash easily with a fork. 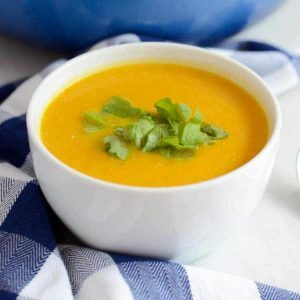 At this point, you’ll want to transfer the soup to a blender (or use an immersion blender if you have one) and puree it until it achieves that smooth, silky, creamy texture. Add the pureed soup back to your stockpot or Dutch oven, simply stir in some almond milk, and season as needed. You’re now ready to enjoy your Creamy Kabocha Squash and Cauliflower Soup hot off the stove, or cool and freeze it for a crazy day when you can’t even face being in the kitchen. Either way, you’ll have a delicious, nutritious meal ready in no time! Or you can continue the cauliflower theme with my roundup of the 10 best low-carb cauliflower recipes! 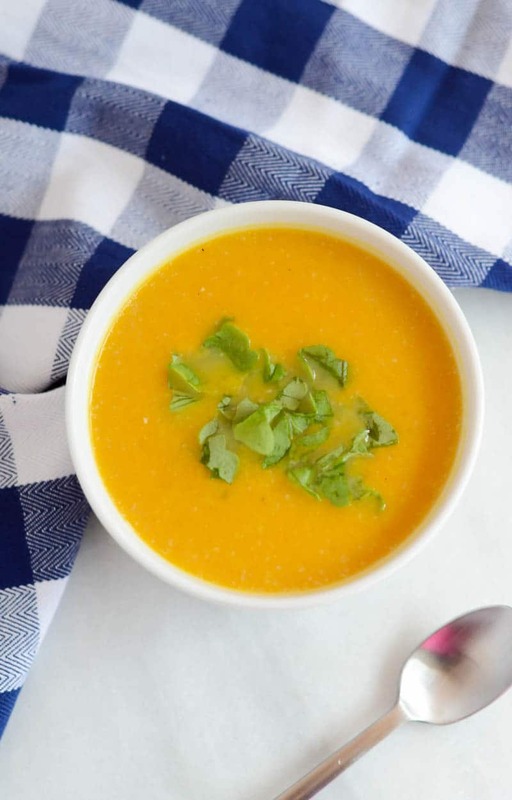 When you’ve tried this healthy Kabocha Squash and Cauliflower Soup, please don’t forget to let me know how you liked it and rate the recipe in the comments below! Warm olive oil in a large saucepan or Dutch oven over medium heat. Add onion, garlic and ginger. Sauté until fragrant and onions are starting to become translucent, about 3 minutes. Add cauliflower, squash, cardamom, cayenne and bay leaves. Stir to combine, then add broth. Bring mixture to a boil and then turn down to a low simmer. Cook for 10 minutes or so, until squash can easily be pierced with a fork. Remove mixture to a high-powered blender to puree, or use an immersion blender in your cooking vessel. Be sure to start on low speed and then slowly increase so the soup does not splatter out and make a mess. Once soup is smoothly pureed, return to the saucepan or Dutch oven over low heat. Stir in almond milk and season with salt and pepper. Enjoy immediately or let cool and freeze for up to a few weeks. Christel is a passionate fitness enthusiast and the co-founder of Diabetes Strong. She is a Certified Personal Trainer specializing in diabetes. As someone living with type 1 diabetes, Christel is particularly passionate about helping others with diabetes live active healthy lives. She’s a diabetes advocate, public speaker, and author of the popular diabetes book Fit With Diabetes.